Peter A. Frasse & Co. The sign reads "Peter A. Frasse & Company, Steel and Tube." It was on the back of a building at 417-419 Canal Street, on the corner of 6th Ave., Manhattan. I took pictures of this sign in Dec. 2006. The building was demolished the following year. Frasse & Co. were hardware dealers and were located here from 1911 to 1925. This advertisement for Frasse is taken from the journal, Machinery, Feb. 1913, p. 170. This one appeared in the Automobile Trade Directory, 1914. The founder was Peter Abraham Frasse (1822-1891). On his death in 1891 the following notice appeared in the New York Times: "Peter Frasse, who died of apoplexy Wednesday at the Adelphi Hotel, Saratoga, was one of the oldest merchants in this city. He had been in poor health for some time. He was seventy years old. 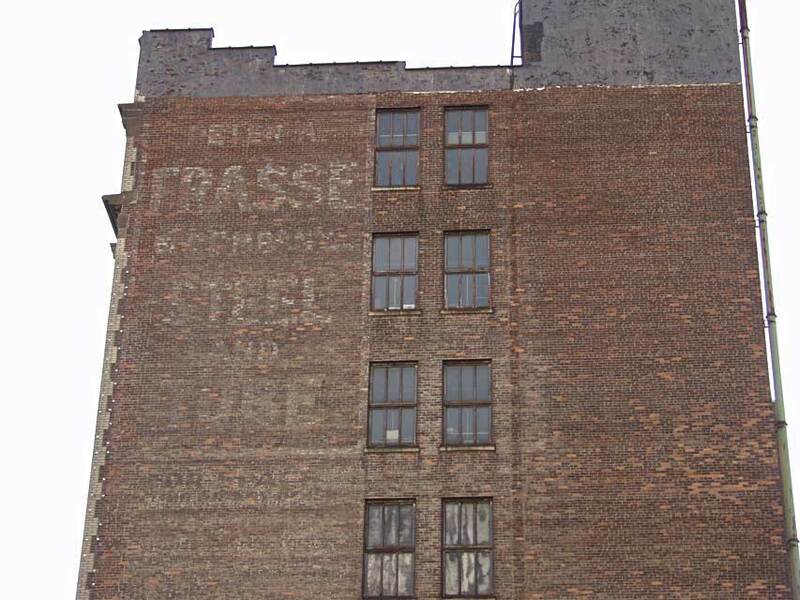 Mr. Frasse succeeded his father in the hardware business at 95 Fulton Street started in 1816. Peter was made a partner when he became of age. He ran a factory in the rear of his store, but gave it up a few years ago. His parents lived at 95 Fulton Street. Peter's father was the first importer of watchmakers' tools in America. Robert Fulton, the inventor of the steamboat, was a regular customer of the firm, and many of the tools used in constructing his steamboat came from there. Mr. Frasse leaves a son and three daughters. Until a year ago he lived at 160 West Forty-seventh Street. Then he went to live at the Vendome Hotel." Frasse can be traced through four successive U. S. Census reports from 1850 to 1880. In 1850 his occupation is described as "watch tools" and in 1860 as "watch tool importer." In 1870 this became "retail tool store" and in 1880 "importer of tools." On 7 Nov. 1855 he married Rosetta M. Campbell in New York City. The couple had 5 children, but Peter Frasse Jr. died 8 June 1862, age 2 years, 4 months and 20 days. The 1850 U. S. Census (non-population schedules) recorded P. A. Frass, Metal & Steel Instrument Maker, as owning $2500 capital and raw materials consisting of 2000 pounds of steel and brass worth $1500. He paid average monthy wages of $80 to an average of two employees, and his annual product consisted of 600 "instruments" valued at $2500. Ten years later the 1860 census recorded P. A. Frasse, Machinist, as owning $1000 capital and raw materials consisting of 3 tons of iron and steel worth $60 and other articles including fuel worth $100. He paid average monthly wages of $100 to an average of three employees, and his annual product of "small machinery" was valued at $2300. A guide entitled Illustrated New York: The Metropolis of To-Day, published 1888, offers the following on Peter A. Frasse & Co.: "The concern dates its inception back to 1816, when it was founded by Mr. Henry F. Frasse (father of Peter A. Frasse), and was continued by him until 1849, when Mr. Peter A. Frasse became the proprietor ... For forty years he continued in the sole control, until, in 1877, he admitted to partnership Mr. John L. Howe ... The firm manufacture hand-cut files, letters and figures in sets, blacksmith, band and machine screw-taps, stocks and dies, steel-pointed plumb-bobs, polishing heads and stands, file and chisel handles, double and single tracing wheels, F. & H. adjustable saw mandrels, slide rests, eclipse blow pipes, machinists' tool chests, etc." Peter Frasse's father was Henry Frederic Frasse (1781-1849), born Neufchatel, Switzerland. Listings appear for Henry Frasse in New York city directories from 1809 to 1847. The last was in Doggett's New York Directory 1847-48, which reads: "Frasse Henry F. & Son, watchmakers' tools." The son at this time was William Henry Frasse (1818-1869), an older brother to Peter Frasse. This advertisement for Henry F. Frasse appeared in A. E. Wrights's Commercial Directory, dated 1840. Henry F. Frasse, machinist, was located at 95 Fulton St. from 1831 to 1842. In 1843 the business name changed to Henry F. Frasse & Son, the son being William Henry Frasse. This advertisement for Frasse from the Trow New York City Directory, 1875, refers to William H. Frasse's business on Chatham St. When William H. Frasse's widow, the former Sarah Jane Negus, died, her death notice in the New York Times (10 Jan. 1911, p. 11) read in part, "Mrs. Sarah J. Frasse, 86 years old, died on Sunday night at the home of her son-in-law, John T. Pierson, 19 Hamilton Road, Montclair, [New Jersey,] of pneumonia. Mrs. Frasse was the widow of William Henry Frasse of New York. She was the daughter-in-law of Henry F. Frasse, a co-worker of Robert Fulton. She traveled extensively, having made forty trips across the continent and some twenty trips to Europe." Peter A. Frasse & Co. left Canal St. in 1925 and moved a block further north to 17 Grand St. (near the corner of 6th Ave. & Sullivan St.). This advertisement appeared in the Brooklyn Classified Telephone Directory, Winter, 1929-30. They stayed in business here until the mid-1960s, then fled the city to Lyndhurst, New Jersey.